The Trustees of Lord Crewe's Charity and the Durham University Library Special collections are very grateful to Mr Peter Flesher and his family for the donation of a book to the Charity, to be held in the Bamburgh Library Collection. The book is Jeremy Taylor's Antiquitates Christianae with William Cave's apparatus or continuation. This went through various editions of which the University Library already holds the 7th (1684) and 9th (1703) edition, with a copy of the 6th edition in the Library of Ushaw College. The donated volume has lost its cover and flyleaf but pending further investigation has been provisionally identified as the eighth editiom (1694). Earlier editions were printed by members of the Flesher family - the 6th edition by E Flesher et al and the 7th edition by M Flesher et al. As far as we are aware there was no involvement in this eighth edition but the book presumably was in the family ownership because of this connection. The book's dedication to Lord Crewe, and the fact that it adds to the other vesrions available in Durham libraries for study and comparison, make it a very welcome addition to the Bamburgh Library. 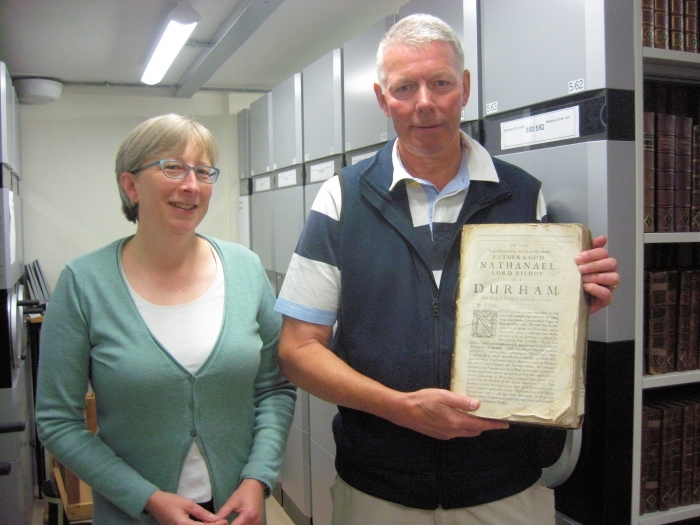 The photograph shows Mr Flesher presenting the book to Judy Burg, Head of Special Collections at Durham University Library, on Thursday 7th September 2017. We are very grateful to Mr Flesher and his family, in particular his wife Lin who visited with him, and his mother Evelyn.